today MV is proud to present to you a miniature which was painted mainly during the private coaching with Erik for explanation purposes. 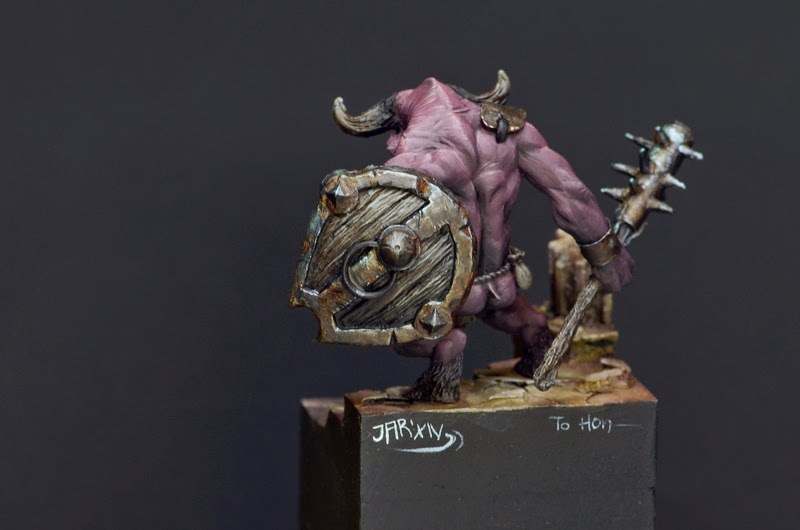 The model is Berrock, Bull Warrior of Marrow Productions' Game "Journey". During the private coaching Raffa did mainly show Erik how he can pimp his base that he brought and Roman mainly did work on Berrock. He stands on one of the Massive Voodoo Insta-Bases (soon more about them!). We hope you like Berrock - this miniature is a gift to Hon and we will ship it soon to him. didn't you start Berrock at the private Coaching with Hon (last picture in the “Hon-article”)? 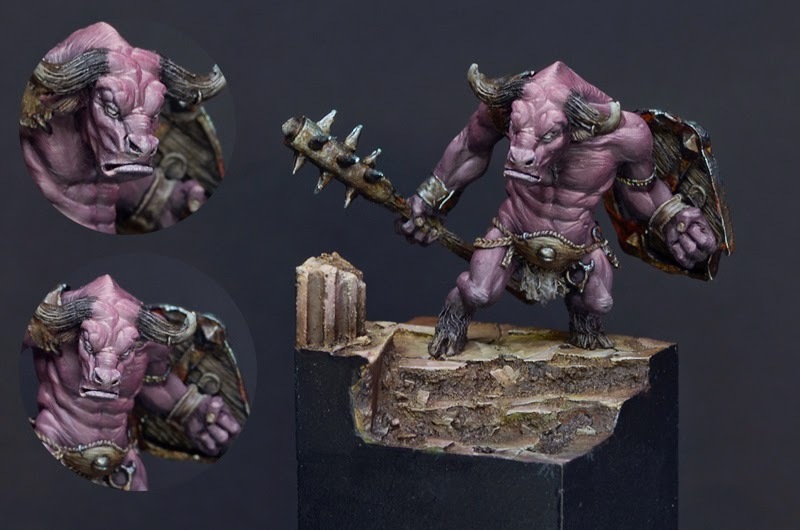 Where do you get the Inspiration for a purple Minotaur? From Milka? No, seriously, where do you get the Inspiration from? 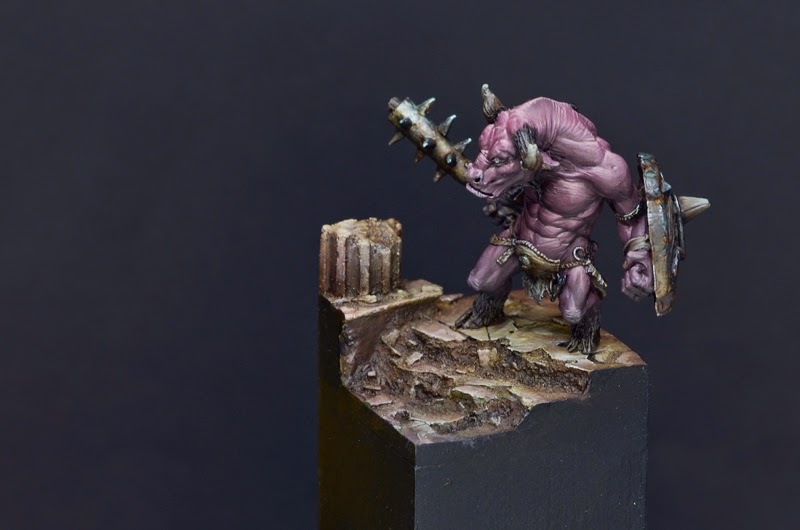 Was there a finished, yellow(ish) base at first and then the idea to paint the mini in the complementary color? Hon, for example, paints a blue "Schweinepriester" with red hair, a blue Minotaur, a red “Monkey-Priest” and so on. I would never have the idea for things like this? I always paint my minis in more "natural" colors so they look mostly brown, a bit dull and sometimes (perhaps mostly) a bit boring. 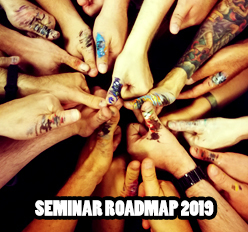 What could be the way to more colorful minis? Close my eyes let my hand circle over my paint-rack and paint the mini in the first color I touch? Choice of color (Inspiration) - perhaps an idea for a tutorial? ….and now to something completely different – I really love the painting (for the BANANALICIOUS-contest) of the “blue clown” – absolutely WOW. It fascinates me more than some of the minis – and that really means a lot. Heyho ... we prepared Berrock during the Coaching with Hon, yes. We thought about maybe painting him beside the coaching if we would find some spare time, but we did not as Hon's topic took all our time. So, we took Berrock for the painting coaching in Erik's coaching time. Well, colour choices. That would be a big and epic article and I keep that in mind to one day write all my thoughts about it. This time - with Berrock - it has been quite simple. If you check back with Erik's colours he did choose during the private coaching - I just used the same for Berrock to have perfect explanation options. Natural colours are not bad if you use them. 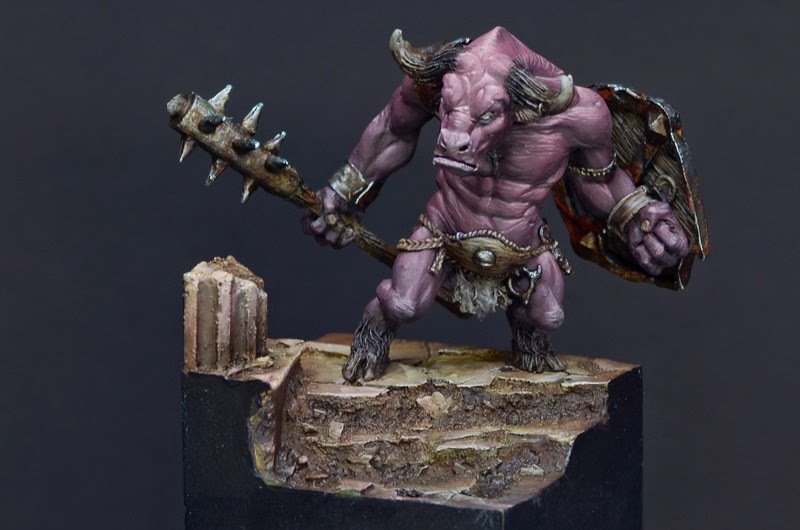 Important if you decide to make more colourful models is that you still keep your powerful colours a little desaturated with a little drop of grey in it. It will still look natural in the end instead of too comic-like, but that is a matter of taste in the end. Happy that you like the clown, I should have some more photos of the finished piece, keep me updated if you want to see them and I'll have them up to the blog if you like. Yes of course - i would be very glad to see more photos of the Clown. A piece i still find very - hmmm - "es bringt eine Saite in mir zum klingen" is an old one you showed in the first days of Massive Voodoo. It is called "Bildtraum" - i hope you know what i mean (writing all over a redbrown background and across that the Silhouette of an "angel? ").